UNNAO (UP): A sadhu’s dream of hidden gold treasure at Raja Rao Ram Bux Singh’s fort here has prompted a team of Archaeological Survey of India (ASI) to survey the area and begin excavation work from October 18. Let’s see, with gold at roughly $43,000 per kilogram, and assuming metric tonnes (why would a sadhu dream in imperial measures?) that is 1000 x 1000 kilograms or 1 million kg, dollar value $43 billion; a tidy sum, to be sure. But wait, what is a sadhu? A sadhu is a holy man, usually itinerant; a seer, an advisor. Many are rightly revered, but many are scam artists and it can be hard to tell the real from the fraudulent. Getting back to the gold, the specific density of gold is 53 cc (cubic centimeters) per kilogram. Our sadhu’s dream therefore was about 53 million cc, which seems like a lot. Sticking with volume, 1,000 cc == 1 liter. The sadhu therefore dreamed a mass of gold 53,000 liters in volume – or, a rectangular block about 10 meters long by 5 meters high by 1 meter wide: that’s a big brick. NEW DELHI: The Archaeological Survey of India has stopped digging for gold treasure at the fort of Raja Rao Ram Bux Singh in Unnao. According to ASI officials, excavations have confirmed that there was no gold at the fort, Times Now reported. Some pottery pieces from Buddhist era have been found from the site. I feel the same way about lottery tickets. Many of mine would have doubtless hit, if only I had not bought them. Where Indian food is concerned, the one thing that seems a universal constant here is comfort. I don’t find a lot of fine dining hereabouts, but all around is food that is filling, satisfying, simple and, well, yummy. 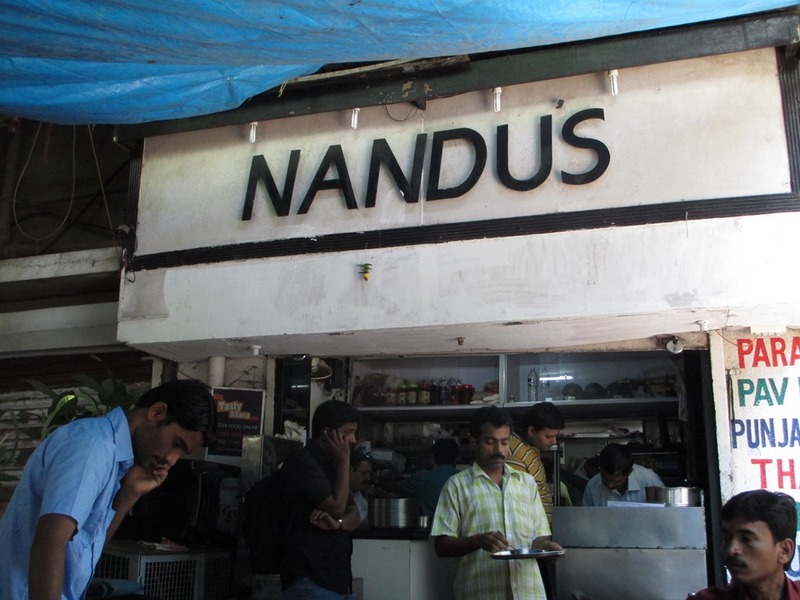 A top example is Nandu’s, where they serve pretty much just parathas, a griddle-fried pancake made from wheat flour and stuffed with different things. Just like the swedish meatball, every culture has its own version of the pancake. India, abundantly blessed in so many ways, has many versions, from dosa to roti to paratha to uppam to madak saan to cheelas and more. This one was stuffed with potato and chopped fresh green chili. It comes with coriander chutney, some raita, and some pickle – mango, lime or other vegetable in salt, vinegar and more chili. On the spoon is a dollop of ghee – clarified butter. It all comes to you hot off the griddle. 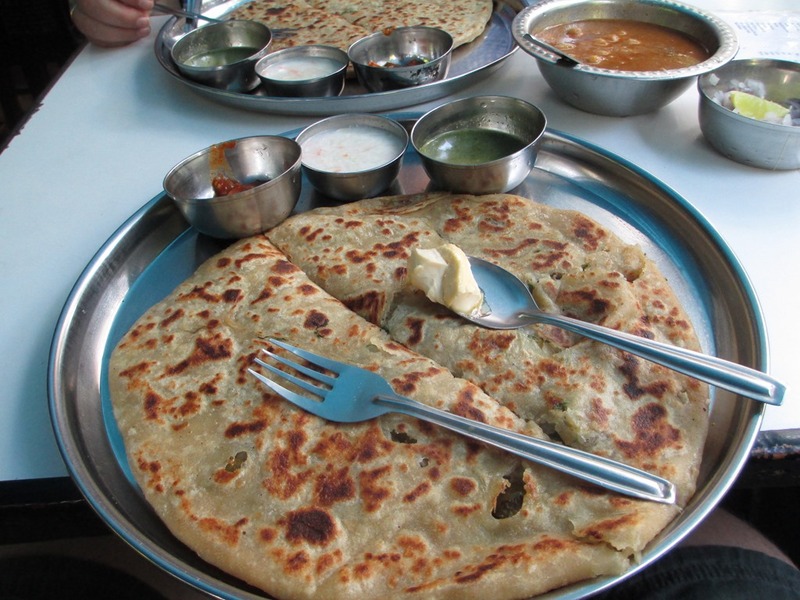 You drizzle the ghee all over, tear off bite-size chunks of pancake, dunk in raita or chutney, and then eat. Then you eat more, and along with thinking how just plain good it is – the butter, the pancake, the filling, all fresh and hot – you’re also cursing every hour you ever wasted eating American fast-food. The price … wait for it … a big, big Rs. 90, or about $1.50. I’ve been in India over a year, with less than a year remaining and people are already asking, “What will you miss when you go?” I have a lot of work to do on that list, but the #1 entry is easy: Nandu’s. BANGALORE: India’s launch preparations for the ambitious Rs 450 crore Mars orbiter mission achieved a major milestone with the successful thermo-vacuum test of the spacecraft with its payloads (scientific instruments). … ISRO said the primary objectives of the mission are to demonstrate India’s technological capability to send a satellite to orbit around Mars and conduct meaningful experiments such as looking for signs of life, take pictures of the red planet and study Martian environment. … After leaving earth orbit in November, the spacecraft will cruise in deep space for 10 months using its own propulsion system and will reach Mars (Martian transfer trajectory) in September 2014. PSLV was developed by India in the 80s and had its first launch in 1993. Providing a national means to launch communications satellites is of course economically very important. Just as significant is the national pride that stems from PSLV. So, Mars! How cool is that? The US has of course sent many famous missions to Mars, and the ongoing discoveries from Curiosity are amazing. But we won’t have another mission till 2020. So for now I say, Go India! JAISALMER: For the dead in the desert town of Jaisalmer, their caste tag lives on. A government agency for urban affairs in the western Rajasthan district has sanctioned separate and clearly marked cremation grounds for different castes and communities. The Urban Improvement Trust (UIT) in its board meeting on July 10 adopted the proposal for developing 47 new crematoriums and sanctioned Rs 5 crore for the project. The money will be spent as per the requirement of various castes and sub-castes, from across the hierarchy. Some of the 47 groups allocated cremation sites are nai, darji, bhatia, kumhar, puskaran, grahaman, ranvanarajput, maheshwari, soni and jeenagar. The UIT is under the jurisdiction of the state’s urban development and housing ministry. The Indian Constitution makes caste discrimination illegal, but nonetheless caste is ever-present. For example, assignment as one of India’s Presidential guards is open only to Rajputs, Jats and Sikhs, three traditional military castes. The authorities explain this is done “purely on functional requirements”, as if only people born in these families have the objective capability of presidential guarding. Castes are nearly synonymous with surname – just by knowing a name Indian people can often develop a fairly accurate picture of someone’s social standing. A book I have read and referred to since coming here is The Tribes and Castes of the Central Provinces of India. This multi-volume work – available on Project Gutenberg and for free on Kindle – was written by R. V. Russell and published in 1916. I have to admit I often take the family names of people I meet here and search for them in this book. For example, here’s what TCCPI says about some of the castes referred to in the cremation article: “Kumhars” are potters, while “Nais” are barbers. The “Ranvanarajput” or “rawana rajput” or “rawna rajput” are a sub-clan of Rajputs – soldiers, as I mentioned above. Caste and occupation are inextricably related. As I said, people of the “kumhar” or “kumbhar” (the Marathi version of the word) community were originally potters; if your father was named Kumbhar, he made pots, and you would make pots, end of story. 100 years ago, or even 60 years ago, this was very close to absolute – there was no choice in what your role in the world would be. But today this is no longer true. While I’m sure many Kumbhars still make and sell pots, LinkedIn shows me over 870 professionals in the Pune area alone with surname Kumbhar, with job titles ranging from “Central Govt Servant” to “Accounts Executive” to “Senior Maintenance Engineer”. While the hard and fast link between caste and occupation is largely broken, caste as community remains. One way you can see this is through the endless marriage websites that exist here, all providing matchmaking services to particular communities, like this one for Kumbhars. If you are a Kumbhar man, there you can browse the profiles and smiling pictures of lady Consultants, Executives, and Sales Professionals, all Kumbhars. And while more and more young people in their online profiles indicate “caste no bar” to marriage – i.e., they would marry outside their caste – today only about 10% of people here actually do that. As an American I shouldn’t criticize. In USA people rarely marry outside their own socio-economic class, though in the US today inter-racial marriages are at an all-time high. But the hard part for me to understand is the arbitrariness of caste, to exclude people not because they are richer or poorer or have a different social experience from you, but because 100s of years ago their forebears were potters, while yours were weavers. “We are afraid that the thunder-storms might have an impact on the scheduled launch.” The Chairman of the Indian Space Research Organization, G. Madhavan Nair, was speaking to reporters in Tirupathi on the morning of May 5, 2005, as the countdown continued for the Polar Satellite Launch Vehicle, a 140-foot rocket loaded with two satellites. Still, he said, he remained optimistic that lift off would occur as planned at 10:19 am. Nair had reason for confidence. Since 1993 the Polar Satellite Launch Vehicle, or PSLV, had been a success story of India’s space program. What’s more, earlier that morning Nair and more than a dozen other top space scientists had visited the Tirupati temple of Lord Venkateswara, where they laid a miniature prototype of the PSLV-C6 at the feet of the deity (a form of the sustainer-god Vishnu also known as Lord Balaji) and offered prayers for a successful mission. Yes, send a vehicle to Mars by all means … but do not neglect to propitiate Lord Balaji before you go. This is India in a nutshell.